News broke yesterday that six have been arrested in an alleged kickback scheme at Sacred Heart Hospital on Chicago’s West Side. According to the Tribune, the hospital was performing unnecessary procedures on patients in order to increase the money it received from Medicare. The procedures in this case appear to be tracheotomies, which is where an incision is made into the neck and trachea so a person can have an airway other than their mouth or nose. Usually a tube is also inserted to help the breathing occur. According to the Illinois Department of Public Health, Sacred Heart is a for profit hospital and in 2011 it provided $11,742 of charity care. What’s interesting is in the breakdown of patients and revenue in the annual report it says 38.2 percent of inpatients were Medicare patients but 60.1 percent of inpatient revenue came from Medicare. Since the raid and arrests happened on Monday, this news story is still unfolding. What’s unfortunate beyond people being heavily medicated and having unnecessary procedures performed on them is if this is all true, this isn’t the first time there has been Medicare fraud committed by a Chicago hospital as part of a kickback scheme. Vice president Roger Ehmen and medical director Dr. Ravi Barnabas were able to turn the nearly bankrupt hospital into a lucrative profit center. The pair tapped Dr. Sheshiqiri Rao Vavilikolanu and Dr. Kumar Kaliana to recruit potential patients. For years the doctors sent hospital employees into the Chicago community to find potential patients. It did not matter if they did not have heart conditions, were drug addicts, were unable to speak English or even had no health insurance coverage. Recruiters instructed the potential patients how to feign symptoms in order to mandate services rendered by Edgewater Medical Center. In return the patients were offered money, food, cigarettes and other amenities for their cooperation. In addition to this doctors at Edgewater Medical Center performed unnecessary angioplasties, which is a procedure where arteries are widened. People were killed as a result of these procedures. As I said earlier, news broke, people were tried and the hospital closed. A simple look on Flickr for “Edgewater Medical Center” will return numerous photos from inside the hospital, many of which make it appear as if the staff simply up and left the building, forgetting to take the patient records and chemicals with them. There are numerous questions to be brought up with both of these cases. What would compel these hospitals to do this? It’s possible that they did this simply so they could stay afloat as other hospitals in Chicago have had to close because they couldn’t afford to keep running. (RIP Michael Reese Hospital.) There are also questions that could be brought in about what it is with Medicare’s set-up that makes the use of dangerous procedures seem like a good way to increase hospital revenue. I’ve heard some things from doctors I know about the set-up of Medicare sometimes pushing them to treat more patients, but I don’t know how much of that is true. I also find it interesting no one criticized Sacred Heart Hospital for how little charity care it provides since it’s on the west side of Chicago. Rush University Medical Center has been criticized for not providing a large amount of charity care–although it’s right next to John H. Stroger Jr. Hospital of Cook County–as has University of Chicago Medical Center on the south side. Again, numbers on charity care aren’t everything and I imagine its status as a for profit hospital came into play with the lack of criticism, but it does strike me as odd no one criticized this hospital. Let’s hope this story doesn’t become worse as time progresses. When I was a theater critic I always asked myself if the play moved me emotionally. (The last play to move me emotionally was “The Birthday Party” at Steppenwolf, which both me and my companion enjoyed. Prior to that, “Othello” at the Milwaukee Repertory Theater.) The greatest failure a piece of theater can make is make me feel numb for the entire thing. But let’s focus on musicals where you cry. I can think of every musical I’ve cried during. “Into the Woods” at the Waterloo Community Playhouse, the first two times I saw “Wicked,” “Company” and three-fourths of “Next to Normal” at the Milwaukee Repertory Theater. Then there are the cast recordings I’ve cried while listening to. I can no longer listen to “Sunday in the Park with George” on my commute because I’ll start sobbing in the car at numerous points in the music. Today I was listening to the music for “Falsettos” in an attempt to relax after a very busy week. This was successful on that front, but I also burst into tears in the car while listening to certain songs. This rarely happens. It’s not like how I know that every other week I’ll cry while listening to “Hello Helicopter” by Motion City Soundtrack. The last time I wanted to cry while listening to the music for “Falsettos”–which is split into “March of the Falsettos” and “Falsettoland” because that’s the only way it’s been released–was while riding a Metra train to Kenosha. I was reading the paper on the quiet car and found I was the only person left on the car. As I got to the song “You’ve Got To Die Sometime,” I found myself wanting to cry. That very brief plot summary has either enticed you or terrified you because this probably sounds like the weirdest musical to appear on Broadway. It ends on a down note. No one comes back to life because their friend tells them to turn around from the light at the end of the tunnel. But it’s realistic, which is probably why I like it. Let’s pretend that nothing is awful. The lyrics aren’t as complex or subtle as Sondheim, but there’s still a great truth that strikes one as you listen to them, which is why I find it to be endlessly listenable. For me the musicals that work the best are the ones which are incredibly realistic even when dealing with fantasy themes, such as “Into the Woods.” They move me and are the ones I’m left breathless after seeing. So whether it’s a musical about an incredibly immature Jewish man who wants a close family or a painter struggling to complete his masterpiece, I celebrate the musicals that make me cry and not even in a silent way. What do you think makes a good musical? And what musicals move you? According to an article in Tuesday, March 6’s New York Times, essentially the only thing we have to fear in the fight against bird flu, or H5N1, is that amateurs could mutate the virus. That’s right, amateurs. Not someone at USAMRIID, the army’s biomedical research facility. Not someone at the CDC, but amateurs. The concern stems from a group of scientists doing experiments where H5N1 was manipulated to a mutant form that spreads easier than it does today. According to the Times’ article, papers on the findings will eventually be published, although no one knows when. According to a November 20, 2011 article by the New York Times, the United States government doesn’t want the exact procedures released in the articles because it could give bioterrorists a how-to guide for creating weaponized H5N1. The idea of people mutating viruses and bacteria in their basements might seem harmless, but according to the article there is a website called DIYbio.org that has D.I.Y. biologists, about 2,000 of them. But if you think of it as a terrorist, there is the problem that too many Americans don’t think of people harmlessly manipulating pathogens in a garage, they think of something much more dangerous. 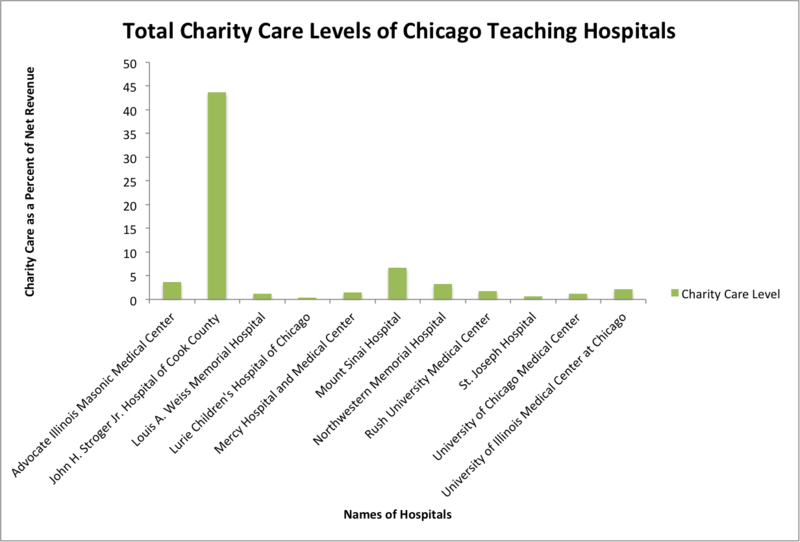 The graph above looks at the amount of charity care given by teaching hospitals in Chicago during the 2011 Fiscal Year. The charity care expenses are for both inpatient and outpatient care. The hospitals were chosen from looking at a list of teaching hospitals from the Illinois Hospital Association and picking hospitals listed as “major teaching.” Both St. Joseph Hospital and Lurie Children’s Hospital of Chicago barely show on this graph due to having only gave 0.7 and 0.3 percent of the respective hospitals’ expenses compared to net revenue going to charity care. 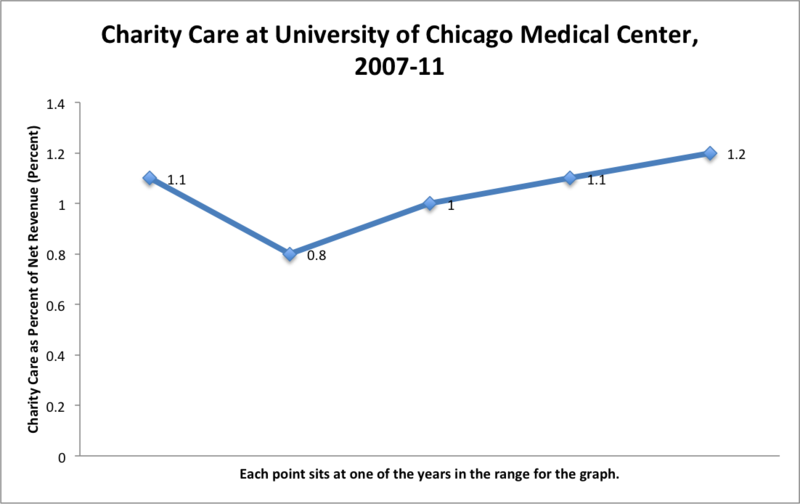 Over this period the amount of charity care given by University of Chicago Medical Center has stayed fairly consistent, only slightly climbing in recent years. 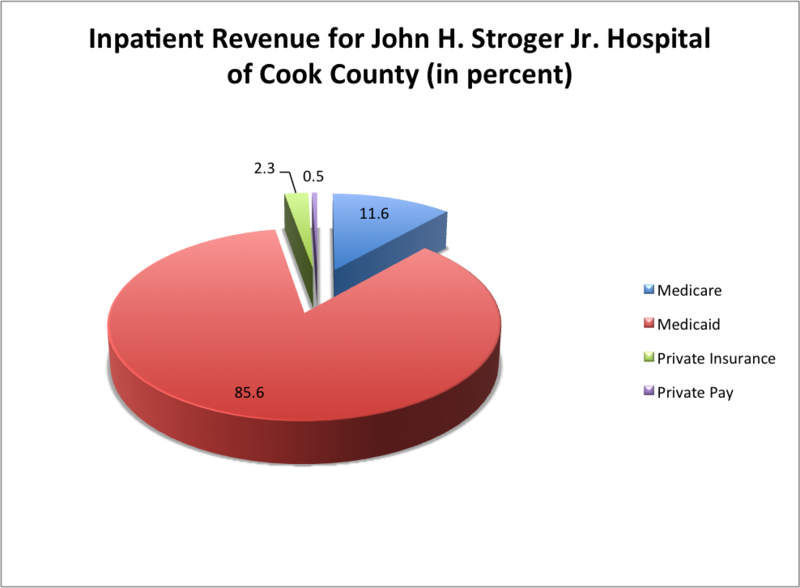 In this figure we see John H. Stroger Jr. Hospital of Chicago, which had the highest amount of charity care given, receives a majority of its revenue from Medicaid. Stroger Hospital is the main public hospital in Chicago and is operated by the Cook County Health and Hospitals System. 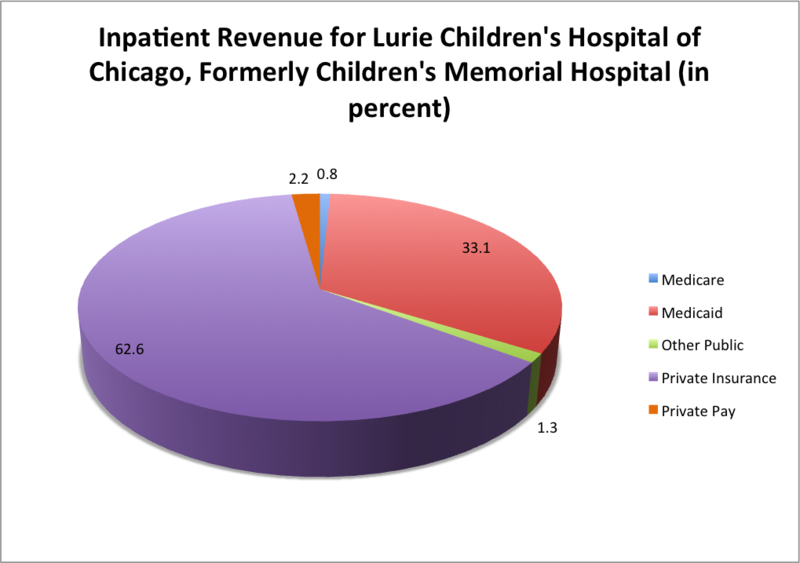 Lurie Children’s Hospital of Chicago, which was still Children’s Memorial Hospital during the 2011 Fiscal Year, received a majority of its revenue from private insurance but also received a third of its revenue from Medicaid. This sizable amount could be the result of Illinois’ program to ensure low-income families have insurance for their children.